An international Festival of art, new media and cybercultures including conferences, an exhibition and workshops. The documentation of my performance Walking Cinema performed at the 'Cinema as Object' study day earlier this year at the Slade School of Fine Art will be included in the exhibition. Impulsive Random Platform launches the new project Impulsive Random Postcards - affordable editioned artworks that allow artists to to experiment with a different medium and reach a new audience. My drawing WE HAVE 30 SECONDS, made during the research process for the 2009 performance Dynamite Fighter with BoyleANDshaw at the Royal Academy in London is included in this first round of postcards. The postcards will be available at the Proud Otter in Amsterdam. IntraGalactic arts collective and HICCUP Stockholm have the pleasure to present the exhibition Tiden märks av färg / Time marked by colour with the artists Maria Högbacke and Malin Ståhl. 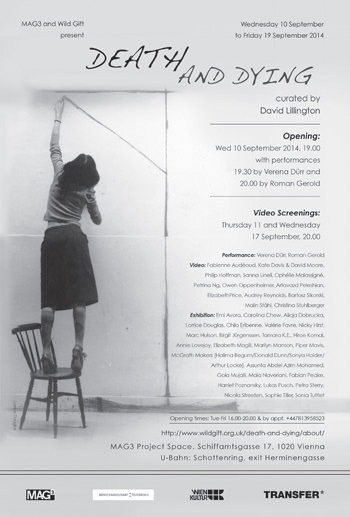 Departing in painting and the performative the artists will be showing painting, sculptural objects and video. 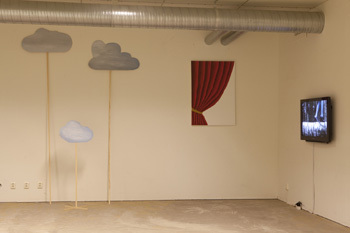 The exhibition will also include a workshop with Malin Ståhl open to the public. The workshop will engage with the themes of the exhibition through physical exercises exploring the notion of space and the position of the body in this space. Tiden märks av färg / Time marked by colour will be shown in Allkonstrummet at Studio Verksamma Tillsammans which is run by Moss exhibitions in Stockholm. Meet six emerging and established artist filmmakers as they present their short film work and discuss it with peers and Adjunct Film Curator Gareth Evans. At Whitechapel Gallery, London. David Lillington curates an exhibition on the themes of death and dying. The death project originally made a link between the prevalence of the subject matter in contemporary art and the idea, common in social science and performance theory alike, that death, dying and memorialising are things that are performed. My video piece We Didn't Say No will be included in the exhibition at MAG3 in Vienna. 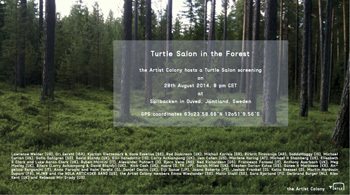 The Artist Colony is pleased to present the screening event Turtle Salon in the Forest. Organised as an open study night we invite the public to experience a collection of film and video works drawn from the Turtle Salon network. 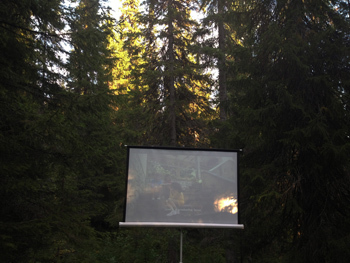 We plan to sit under the stars, comfortably wrapped in blankets, and watch videos until the break of dawn. Grädda Bakery will join us to keep us warm with one of their lovely soups. Works by Lawrence Weiner (US), Ori Gersht (ISR), Kjartan Slettemark & Hans Esselius (SE), Rod Dickinson (UK), Mikhail Karikis (GR), Rirkrit Tiravanija (AR), DoddaMaggý (IS), Michael Curran (UK), Sofia Dahlgren (SE), David Blandy (UK), Elín Hansdóttir (IS), Larry Achiampong (UK), Jem Cohen (US), Marlene Haring (AT), Michael H Shamberg (US), Elisabeth S Clark and Luke Aaron Clark (UK), Ruben Montini (IT), Alexander Pohnert (D), Bjørn Venø (NO), Ned Richardson (US), Francesco Fonassi (IT), Anthony Auerbach (UK), Meg Mosley (UK), Biters (Larry Achiampong & David Blandy), Nick Cash (UK), nüans (D,TR,JP), Sarah Miles (UK), Stephen Dorian Kutos (US), Sunee H Markosov (KR), Angelica Bergamini (IT), Anna Faroqhi and Haim Peretz (D), Daniel Devlin (UK), Eiji Suzue (JP), Joana Roberto (PT), Joshua Frankel (D), Katia Roessel (D), Martin Hardouin Duparc (FR), MJWB and the NOLA ARTICHOKE BAND (US), Ila Wingen (D), the members of the Artist Colony Malin Ståhl (SE), Emma Wieslander (SE), Sara Bjarland (FI), Gerbrand Burger (NL), Alex Kent (UK) and Rebecca Mir Grady (US). Photo by Rebecca Mir Grady. Release Party as part of the Göteborg Dance & Theatre Festival closing party at Stora Teatern in Gothenburg. Koreografisk Journal #2 includes my text on immobility as resistance En skiss en tanke om motstånd. Moonlight Ritual with Aubergines is part of Bellyflop Magazine's Open Week.